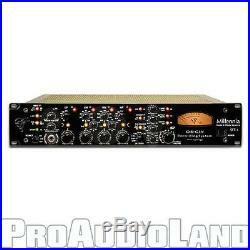 Millennia STT-1 "The Origin" Recording Channel Strip Mic Pre Amp EQ Compressor NEW. Genuine Millennia Factory Package Includes. Millenia All in One Single Channel Recording System STT-1. Millennia All in One Single Channel Recording System STT-1. Over 130 Optimized Signal Topologies. Twin Mic Preamps M-2B vacuum tube or HV-3 discrete solid state. Twin NSEQ-2 Mastering-Grade Parametric Eqs vacuum tube or discrete solid state. Three Opto Compressor/Limiter Paths TCL vacuum tube, discrete solid state, passive. Twin Opto De-Esser Paths vacuum tube or discrete solid state. Vacuum tube or discrete solid state line level paths. Input coupling with or without MIT-01 audio transformer. 1/4 vacuum tube DI input route via tube or solid state gain path. Effortless, lifelike musical performance at all levels. Musically rich vacuum tubes available. Gold audio connectors, tube sockets, relays and switches. 3/8 thick radius extruded aluminum face plate. Durable black mirror-gloss anodized finish. Mil spec 16 gauge cold-rolled steel chassis. Ultra-clean toroid power supply: internal sub-chassis. Hand machined aluminum knobs, illuminated IT&T pushbuttons. Mogami Neglex OFC audio wiring. True audio VU meter for output level or dynamics gain reduction. Twin Topology Mic Preamplifier Selection: Switchable, Vacuum Tubes or Solid-State. Twin Topology EQ & Compressor: Switchable, Vacuum Tubes or Solid-State. Twin Topology Input Coupling: Switchable, Transformer or Transformerless. Maximum Output Level (Balanced): + 32 dBu. Frequency Response: +0 / -3 dB (S/S), sub 5 Hz to beyond 300 kHz. Equivalent Input Noise: -131 dBu (SS, Common Source, Direct Out). THD + Noise: 20 Hz - 22 kHz (S/S). Input Impedance (Mic): 6,200 ohms. Input Impedance (Line): 2,200 ohms (x2). Input Impedance (Di - Instrument): > 1 megohm. Output Impedance (Balanced): 24.3 ohms (x2). Parametric Equalizer, Maximum EQ Boost/Cut Range (21 Step Detented): +/- 15 dB. Q Range: Q = 0.4 to 4.0 Adjustable on middle ranges, Q = 1.0 Fixed on low & high ranges. Low Range Switch (Centers - Peak/Shelf Selectable): 20, 34, 56, 100, 180, 270. Low Mid Sweep: 20 Hz - 220 Hz or 200 Hz - 2.2 kHz. Hi Mid Sweep: 250 Hz - 2.5 kHz or 2.5 kHz - 25 kHz. High Range Switch (Centers - Peak/Shelf Selectable): 4.8 k, 5.8 k, 8.0 k, 10 k, 16 k, 21 k. Threshold Range: Infinite to +20 dBu. Attack Range: 2 ms to 100 ms. Release Range: 80 ms to 3.0 s.
Compression Ratio Range: minimum 1.4 : 1, maximum 30 : 1. De-Essing Frequency Switch: OFF, 4.9 k, 6.8 k, 8.2 k, 10.7 k , 12.0 k.
Power Consumption: 50 watts maximum. Power Requirements: Selectable: 100-120, 200-240 V ac, 50/60 Hz. Genuine Millenia Factory Package Includes. We are here to help answer any question you may have. We can easily be reached using one of the options below. Pro Audio Land 3200 Fujita St Torrance, CA 90505 USA. The item "Millennia STT-1 The Origin Recording Channel Strip Mic Pre Amp EQ Compressor N" is in sale since Saturday, April 29, 2017. This item is in the category "Musical Instruments & Gear\Pro Audio Equipment\Preamps & Channel Strips". The seller is "proaudioland" and is located in Torrance, California. This item can be shipped worldwide.